There's a lot of dancing in Rhode Island, but don't forget that you're not that far from venues in southern Massachusetts or eastern Connecticut. Venues in and around Boston itself are only about an hour away. For more information, contact bbdc@brown.edu. The New London County chapter of the US Amateur Ballroom Dancers Association serving the New London county, just across the border. Regular dances are held at the East Lyme Community Center in East Lyme. At Studio One, 85 Industrial Circle, Lincoln. 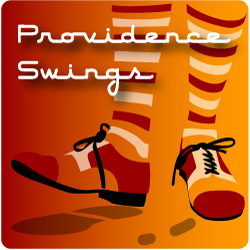 For more information, contact them at info@providenceswings.com or 401-365-7700.
riDance is dedicated to all things dance in the Ocean State. Note: The website hasn't been updated since 2013 and I'm waiting to find out what their current plans are.